Some miscellaneous photos of Krakow, most of its historic centre. 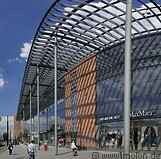 The Galeria Krakowska is a big and modern mall near the railway station. Its hosts a multitude of shops and a small food court.